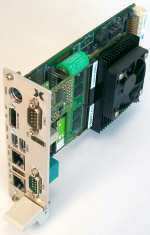 Janich&Klass continues developing state-of-the-art processor cards for the ISA96- and AT96 bus. This way, their customers can still use their renowned and cost-efficient systems and cards also in the future, and can secure their existing Know-How and experience. 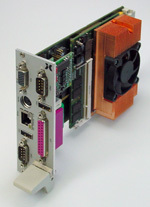 The "D2/103" card offers highest processor performance at low power consumption, and an interface equipment that supports well-known old standards, and also actual standards. The D2/103 bases on the Intel Core 2 Duo mobile processors that are specially suited for industrial applications. The maximum power consumption of these processors is between 10W and 35W, depending on its type. A hardware mechanism in the processor protects it from overheat, by reducing its performance while the application continues running. As successor of the renowned CPU boards from the M4 series, Janich & Klass has developed the industrial high-performance processor card ISA96 A2/103. The core of this 3U/8HP board is the CPU Module A2 with firmly soldered processor, DDR3 main memory, and processor power supply. The CPU Module bases on Intel's Ultra-Mobile Platform "Pineview" with the "Atom" processors N455, D425, and D525, and also the I/O-Controller "ICH8". The processors are available in different clock rates, with 1.6GHz or 1.8GHz. The firmly soldered DDR3 main memory is equipped with 1GByte, or 2GByte. On demand, the main memory size can be doubled, by adding an SODIMM module. For many industrial CPU boards an extreme low heat production is more important than a very high clock rate. Only this way, fanless or even hermetically encapsulated systems can be realised. The newly developed ISA96 V8/103 was specifically designed for such conditions. It allows to operate 500MHz class systems with less than 5W of power consumption, without leaving the narrow price frame of Low-Cost applications. The H1/103 with its ultra-low-power 4th generation of Intel's Core i-processors (codename „Haswell“) continues Janich&Klass CPU boards made for ISA96- and AT96-Bus. Staying mostly compatible with Janich&Klass predecessor boards V8/103, D2/103, A2/103 and M4/103, the H1/103 furthermore offers awesome enhanced performance and modern high speed interfaces. Still with the base version of the board there will be 2 Gigabit Ethernet Controller and 2 USB3.0 interfaces included. The outdated VGA port is replaced by a DisplayPort connector, where easy adapting to HDMI, DVI and even VGA is possible, if needed. For storage devices there is still a CompactFlash socket and an optional mounted 2.5” drive holder and as an improvement the option to use so called SATADOM modules.